Large capacity, works well, and looks great. Takes up quite a lot of work surface due to it's large dimensions. The Panasonic NN-A873S1 combi microwave is pretty large - 53.0cm by 34.4cm by 50.8cm - and as such will not be suitable for those with smaller kitchens. However for those who are looking for a large combi microwave, then this model will be ideal - with an overall 32 litre capacity. It's pretty powerful too - 1000w when in microwave mode, and 1500w when using the grill facility. The built in convection oven provides a temperature range of 100-250 degree Celsius. 6 different power levels are included, together with various handy auto cook settings. The exterior is finished in a sleek and stylish stainless steel finish, which all of our testers liked. 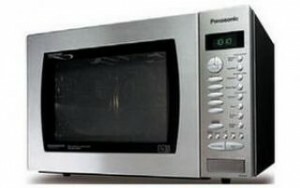 Overall build quality is good, as you'd expect from Panasonic, and this silver microwave oven felt like it would put up with the general wear and tear associated with regular use. Essentially this model is a very large family combi microwave, which is easy to use and should turn out to be pretty reliable, based on our experiences with Panasonic microwaves. It looks great, is easy to use, and should last for years. A very well built combi microwave, with a huge 32 litre capacity. Looks good, easy to use and should prove to be reliable.